Treatment: Some Peppermint shrimp and Copperband Butterflyfish eat aiptasia, but it varies by animal. Aiptasia can be injected with a store-bought product, very hot water, or vinegar, and they can be removed manually with a scalpel or razor blade. 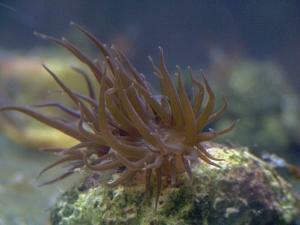 Identification: Aiptasia are small, translucent, brown anemones. Adults have a slender stalk 1-2" long, and 1-1.5" tentacles. 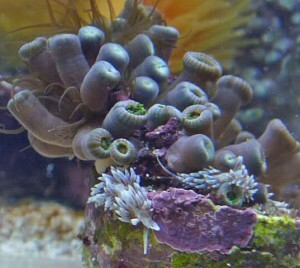 Prevention: Carefully inspect all liverock and coral; remove or destroy the aiptasia and rinse the rock before placing in your tank. Be vigilant! Once established, aiptasia is notoriously hard to eradicate.